A shrine dedicated to scholarship with beautiful plum and maple gardens. Kitano Tenman-gu Shrine is one of the most important of several hundred shrines across Japan that are dedicated to Sugawara Michizane, who has been worshipped in Japan since ancient times as the god or patron saint of scholarship. During the season of college and university entrance examinations, the shrine is always crowded with people praying that they will pass their exams. 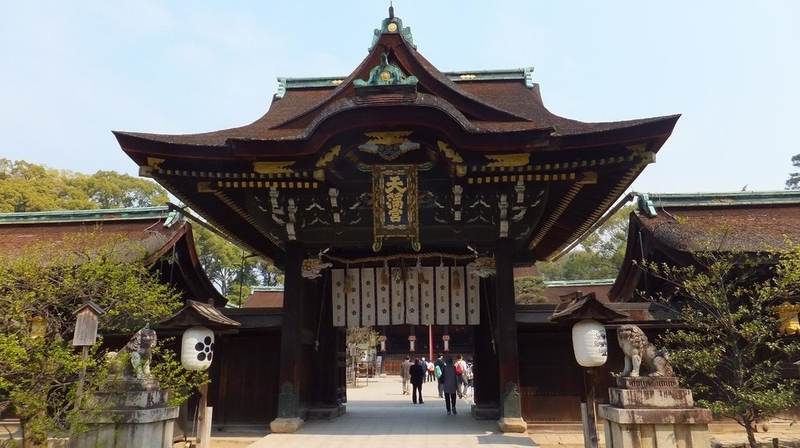 Chu-mon (the gate located between Nandai-mon and the main buildings), also called Sanko-mon is designated by the national government as an Important Cultural Property. The front shrine inside the precinct, which is the building used by pilgrim to the shrine, as well as the main structure, which enshrines the deity, and the Ishi-no-Ma, were built in the 17th century. All are designated as National Treasures. Many of the other buildings of the shrine are designated as Important Cultural Properties. The shrine is famous as a place for viewing plum blossoms. Sugawara Michizane loved plum trees and Kitano Tenmangu features an entire grove of nearly 2000 trees that bloom from February to March. The shrine open its garden to the public during the peak of the autumn leaf season from November to mid December. Hundreds of maple trees line the garden’s stream and are lit up in the evenings. Viewing Ume plum blossoms with Maiko at Kitano Tenman-gu. Every year Ume matsuri at Kitano-Tenmangu Shrine is held on February 25th. One of the main events along with viewing plum blossoms is the special outdoor tea ceremony “Baikasai”. Hot matcha tea and traditional Japanese sweets are usually served by Maiko. If you like drinking a hot cup of matcha tea then you should try one here. The shrine grounds offer you to 2000 plum tree blossoms from early February to mid March. You can enjoy walking through the plum grove paths inside the shrine area. They look beautiful when they are in full bloom and the Plum’s sweet smell comes from the colorful blossoms. This festival is held in appreciation for the year’s grain harvest. The festival began as an offering of new rice husks, vegetables and fruit to the deity. The name comes from the portable shrine, which is adorned with a taro stalk roof. Kitano-Tenmangu Shrine opens its maple tree garden to the public. Illuminations are held during the peak of the autumn leaf season. The admission fee includes a cup of green tea and a snack.